User feedback: Are you paying attention? Before we talk about user feedback, let’s explore one important question: Are your customers the central focus of your business? If you do not operate with the fundamental belief that everything must revolve around attracting and retaining your target customers, your business will not survive today’s fiercely competitive marketplace. Reicheld & Sasser reiterate the benefits of focusing on the customer. “Customer service effectiveness is important because organizations that provide good customer service gain a competitive advantage over organizations that do not. For example, quality of customer service is related to customer loyalty, customer retention, and increased organizational profits.” They stress that “loyal and satisfied customers serve as an important source of free advertising through referrals and recommendations, whereas unsatisfied customers are more likely to defect and to convey negative experiences to other potential customers”. User feedback is an excellent way to focus on customers and keep them happy. When you ask users to express their needs, share their ideas and communicate their concerns, you are validating their importance to the survival of your business. This is a form of acknowledgment that builds loyalty and retention. The added benefit is you will be creating and delivering the right products and services. 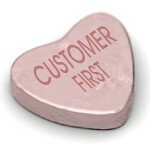 It is no secret that customers appreciate organizations that solicit and value their feedback. In the same way, I will appreciate receiving feedback regarding this blog from product managers or other business professionals interested in collaboration software and customer relationship management. Some argue that asking users for feedback to incorporate customer suggestions and ideas, leads to a loss of control over the product development process or strategy. However, business savvy people know how to optimize a user feedback process that is win-win for everyone. To quote Jeremiah Owyang: “there’s a huge difference from gaining just a little bit of user feedback to build a better product than none at all”. In fact successful organizations ensure employee, partner and user feedback provides valuable insight to the product development process. Internal and external user feedback must be solicited and integrated in all aspects of the business. There are several ways to acquire and manage user feedback. OneDesk comes with a customer portal that connects the customer to the product development process and makes customer feedback management easier. -Employees, partners and customers can work together to incorporate customer feedback into the development process and turn them into actionable items. -Companies can publish suggestions for customers, employees and partners to vote for the ideas they like. The best ideas rise to the top. -Overcome product-decision challenges by polling customers and finding out what they really want. OneDesk’s tools also allow you to link feedback to requirements, turn them into tasks and assign them to the appropriate teammate to take action. With these first-class social collaboration tools you will be certain that user feedback is addressed and not ignored, and problems will be escalated for action to the right person in your organization. What do your customers think? Ask for feedback!